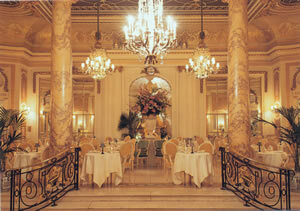 Tea at The Ritz is one of the most loved institutions in London. But it has not always been so. I first started going to the hotel 45 years ago. In those days, at four o’clock of an afternoon, if the fancy took me, I could wander in through the entrance on Piccadilly – now, I suppose for reasons of security, no longer used – go straight to the Palm Court, survey the empty tables (there were always lots of empty tables), choose the one I liked, and order the full tea. It would cost me the handsome sum of half a guinea, ten shillings and sixpence (52½ pence in the new money). Even then, it struck me as rather odd that more people did not enter one of the most beautiful and lavishly furnished buildings in England to enjoy the tea-time ritual. What a lot they were missing, I used to tell myself. Today things are rather different. Now you will have to book for tea – and not just book, but book well in advance. It seems that everyone wants to have tea at The Ritz. And everyone is right. For even for those of us who have spent many decades lingering in the Louis XVI style gilded salons of this architectural masterpiece (designed by Charles Mewès and Arthur Davis in 1906), there is still a tiny tingle of excitement each time we enter The Ritz. While the other grand hotels of London have been subjected to ‘re-branding’ and ‘re-styling’ – invariably to their detriment – The Ritz has remained true to its origins, and is therefore among the world’s most elegant and most luxurious establishments. 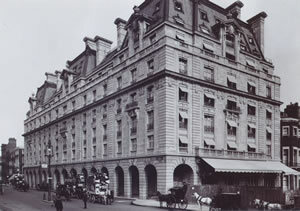 Indeed, in the ownership of Sir Frederick and Sir David Barclay, The Ritz has prospered wonderfully, and looks as beautiful now as it did on the day it opened – which is when the black and white photograph of the exterior was taken. One thing which has certainly not changed in my time, thank goodness, is the dress code at tea for gentlemen, who are required to wear a jacket and tie. And – mirabile dictu – “jeans are not permitted”. Sadly, sartorial standards for men have collapsed all over Britain (yes, even in the other grand hotels), and The Ritz is one of the few public places which still maintains the better way. It is part of its distinctive and immutable character. Were it ever to be abandoned, I would expect the ravens to desert the Tower of London shortly thereafter. Popularity, of course, can bring its own challenges. Pressures inevitably increase. When you are serving 400 teas a day over the course of five sittings – which begin, astonishingly for ‘afternoon’ tea, at 11.30 in the morning – can the highest standards possibly be maintained? 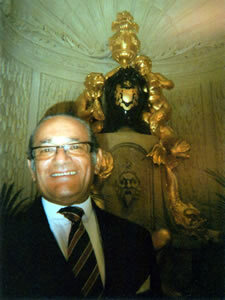 Well, yes, they can – when the Manager of the Palm Court is the remarkable Mr Michael Kotb (pictured). Mr Kotb hails from Egypt. When you see him at work – ensuring that every table is properly served, that there is no sense of any part of the service being rushed and that every guest, no matter how important or lowly he or she might be, feels ‘special’ – you begin to understand a little of how the pyramids were built by his ancestors. Mr Kotb is, of course, always immaculately dressed, in morning dress and a starched collar. (Indeed, he must be one of the few people in the Metropolis who wears a stiff collar more frequently than your correspondent.) From the photograph you will suppose, rightly, that he smiles easily. He is also courteous, commanding and decisive. It is a tribute to his style of leadership that so many of his staff have been with him for so long. 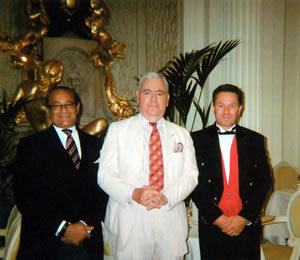 Ian Doughty, for example – in the picture with Michael Kotb and myself – has been serving tea at the Palm Court, with charm, friendliness and efficiency, for nearly a quarter of a century. And every other waiter I encounter on my frequent visits is, like the admirable Ian, a model of what a good waiter should be. Indeed, I rather suspect that they would not be at the Palm Court for very long if they were not, for Mr Kotb insists on the highest standards. The waiters are exceedingly smart in their red waistcoats and black tailcoats. One has the strong sense that they are proud of their work and that they are proud of The Ritz. And so, dear Reader, we come to the tea itself, which costs £45, or £57 with a glass of champagne. 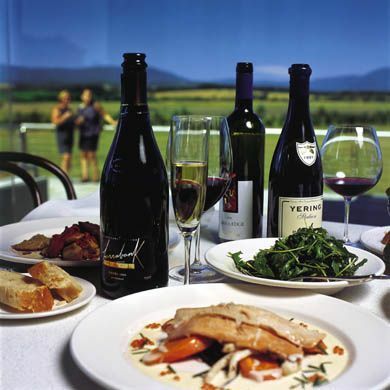 The prices have increased somewhat since my first visit, but that is what you would expect. And this tea is not just any tea: it is afternoon tea consumed from the finest porcelain, with the very best damask napery, to the sound of a tinkling piano or a plucked harp, as one sits on an elegant fauteuil within the jewel box of pink and gold which is the Palm Court of the Ritz. First, a decision must be made. The Ritz offers 17 sorts of leaf tea, which will be poured from a silver-plated teapot through a silver-plated tea strainer. I will confess to you a modest eccentricity: I like my Earl Grey to be served with a dish of ice cubes, which I add to my tea cup, one by one. I think I am alone in this particular habit. The food begins with a delightful medley of sandwiches, cut into small rectangles and, I need hardly say, without crusts to the bread. Their fillings include smoked salmon, cucumber, roast ham and Cheddar cheese. My favourite, I think, is the sandwich made with white bread and succulent chicken breast – given a pleasing piquancy by the addition of a little horseradish cream. It is entirely typical of the sense of bounty which pervades The Ritz that – just as you think you have finished this part of the meal – a waiter appears with a silver salver laden with sandwiches, and asks whether you would like some more. Then, warm from the oven, the scones arrive – apple and raisin scones, with clotted cream and strawberry jam. They are soft and yielding, just as scones should be. And all the while, on the stand in the middle of the table, waiting for their moment in the spotlight, are the pastries – almost naughty in their seductive prettiness. My particular indulgence is the small but totally gorgeous vanilla slice. And still the show is not over. For now appears, slow and stately, the mobile finale: the cake trolley. From it comes first a small glass pot filled with cream and fruit (sometimes strawberry, sometimes – my weakness – rhubarb), and then a choice of a slice of one of two cakes (perhaps lemon cake and Black Forest gateau), cut by the waiter as you begin to wonder whether this delicious tea will ever end. But end, as all created things must, it does. And then it is time to depart. 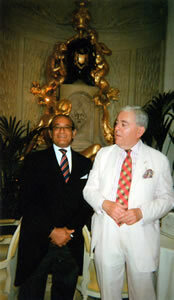 As I leave each time, and Mr Michael Kotb wishes me a courteous farewell, I think always of my return. 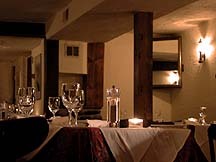 The glorious building, the sumptuous décor, the immaculate staff, the generous hospitality, the well-dressed fellow guests – these make this place unique. 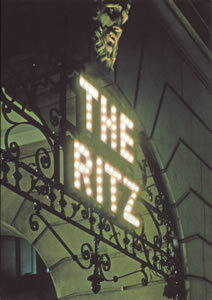 The Ritz is The Ritz is The Ritz. And Tea at The Ritz is truly one of the most loved institutions in London. 150 Piccadilly, London W1J 9BR, England.